All farmer-members are invited to attend Grain Farmers of Ontario’s 2016 Annual General Meeting on Tuesday, September 13 at the Quality Hotel & Suites in Woodstock. The business portion of the meeting will be held in the morning and all attendees will be given passes to attend Canada’s Outdoor Farm Show in the afternoon. A limited block of hotel rooms has been arranged in Woodstock and in Cambridge. Please call 1-800-265-0550 and speak to Maegan MacKimmie or go to www.gfo.ca for details and availability. Grain Farmers of Ontario will be at Canada’s Outdoor Farm Show from September 13 – 15. You can find us on 1st Lane (Seed Alley). Stop in for a coffee and a chat with a staff member or director. Tony Balkwill, Grain Farmers of Ontario’s sponsored Nuffield scholar, will be at our tent on September 14 to talk with farmers about his precision agriculture research and participation in the Nuffield program. Grain Farmers of Ontario is a bronze sponsor of the 2016 International Plowing Match in Minto being held September 20 – 24. We will also once again be sponsoring the VIP tent and plowing match. The Growing Connections trailer exhibit will be on display to showcase the Good in Every Grain. Grain Farmers of Ontario is looking for soybean growers interested in becoming a leader within the agricultural industry. The American Soybean Association (ASA) DuPont Young Leader program focuses on developing leadership, strengthening marketing and media skills, and learning more about the soy industry. It is also an excellent opportunity to network with other farmers from the ASA’s 26 state affiliates. For the 2017 program, participants (individuals or couples) will attend two sessions — one at Pioneer’s Iowa headquarters in late fall 2016, and the second during the 2017 Commodity Classic in San Antonio, Texas. Applications will be accepted until August 15. Apply online at www.soygrowers.com/learn/young-leader-program. A Grain Farmers of Ontario selection committee will evaluate the applicants from Ontario and choose one couple or individual for the 2017 program. For more information contact Steve McCabe, manager, member relations, Grain Farmers of Ontario at smccabe@gfo.ca or 519-767-9713. Soybean producers are reminded about the need to confirm drying charges which are now calculated under the Agreement for Marketing the Ontario Soybean Crop made under the Farm Products Marketing Act (O.Reg 485/09). Grain Farmers of Ontario and SGS Canada Inc. officially celebrated the opening of the Grains Analytical Testing Laboratory on July 11. The Grains Analytical Testing Laboratory is a joint venture that will see the development of a full analytical testing facility for cereal crops. Located in Guelph, Ontario, the lab offers a full suite of tests including rheological testing, physical dough and bake testing, protein levels and more. The lab is dedicated to Ontario cereal crops, but will also offer full commercial services for Ontario, Canadian, and North American millers and processors. In June, Paolo Santangelo took on the role of commercial manager — cereal for the lab. He will focus on working with Ontario and Canadian cereal crops to improve value-added usage within domestic and export markets. The position will also act as a technical support liaison with North American millers and customers. Santangelo brings more than 12 years of experience in the manufacturing of food ingredients, including most recently with Rogers Foods Ltd. serving as director of quality and technical sales. He holds a BSc. in biological sciences from the University of Lethbridge; a diploma in pure and applied science from John Abbott College; a diploma of practical milling from the Association of Operative Millers and is a certified baker through the American Institute of Baking. Grain Farmers of Ontario is involved in a sustainability initiative called the Canadian Field Print Initiative (CFPI). This initiative is working towards developing market-driven, science-based, and outcome-focused metrics which will examine key on-farm indicators helping to tell the farm sustainability story across Canada. A number of projects have been developed as part of the CFPI, including the Canadian Field Print Calculator. This is an easy-to-use, farm level measurement tool that allows growers to assess their environmental performance. This calculator is an Excel based tool which can help farmers quantify sustainability indicators on land use efficiency, energy use, climate impact, and soil erosion risk. Another project includes the development of a sustainable metrics indicator report for Canadian Field Crops. This report demonstrates the environmental progress for grains and oilseeds in Ontario over the last three decades. The improvement can be seen in land use, soil loss, energy use, and climate impact indicators. For more information on these projects, visit www.fieldprint.ca. The newly developed website has been designed to provide information and material to participants of the CFPI, and is also meant to provide information for companies, associations, and individuals who are unfamiliar with this work. Farmer-members looking to find out more about the work done by Grain Farmers of Ontario can now see a weekly video update on our YouTube channel. 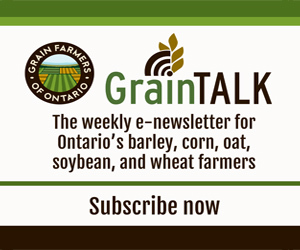 Inside Grain Farmers of Ontario was launched at the end of June. Each video will showcase a different department or event through an interview with a staff member in that area of work. www.youtube.com/user/grainfarmersontario. The June 30 United States Department of Agriculture (USDA) report is always key to our grain price environment and 2016 is no different. In the report, USDA surprised the market by increasing the U.S. corn planted acreage to 94.15 million acres, up from their March 31 projection of 93.6 million acres. This was a surprise because the spring price rise in soybean futures had many analysts thinking corn acres would be down. Soybean acreage was pegged at 83.7 million acres within trade expectations. U.S. wheat acreage also rose. This year’s Research and Knowledge Transfer Survey is open from Friday, August 5 until Monday, August 22. This is your chance to provide feedback to guide the direction of Grain Farmers of Ontario’s research direction and to tell us what is your preferred way to hear about research results. Every farmer-member who completes the survey will be entered into a prize draw — details can be found at www.GFO.ca/Research. Winners will be announced in the October issue of Ontario Grain Farmer and in the Bottom Line E-Newsletter. Every year, the Grain Farmers of Ontario Research Department conducts a survey to help determine our research priorities for the year’s research projects. In the past, the survey has been sent out to Grain Farmers of Ontario delegates and directors; Certified Crop Advisors (CCAs); and Ontario Ministry of Agriculture, Food and Rural Affairs specialists. This year, we’re opening up the survey to all our farmer-members to get a more representative pool of respondents. Another new addition to our survey is the knowledge transfer component, where we are asking you to let us know what topics you want to learn about and where you’d like to find the information. Complete the survey online at www.GFO.ca/ResearchSurvey beginning August 5, or call the Grain Farmers of Ontario office at 1-800-265-0550 to request a paper copy of the survey. Ontario’s grain and oilseed sector is poised for growth. Growth in the grain and oilseed sector will increase jobs and economic activity in rural areas that depend on farming and provide a greater contribution to Canada’s GDP. An Agricultural Policy Framework (APF) designed to provide strategic investments in Ontario grain and oilseed farming will help farmers realize these economic opportunities for Canada and support grain and oilseed farmers’ contributions to Canada’s climate change goals. This includes business risk management such as income stability programs and Agri-Insurance; as well as non-business risk management programs such as research and commercialization, environment and climate change, and market development. You can read details of Grain Farmers of Ontario’s recommendations for Canada’s next APF online at http://gfo.ca/Government-Relations/Government-Relations-Programs. Use of Manipulator™ on the 2016 Ontario Wheat Crop Grain Farmers of Ontario and the Ontario Agri Business Association (OABA) have been involved in a broad industry discussion regarding the serious implications of using Manipulator™ (chlormequat chloride) as a growth regulator on the 2016 Ontario wheat crop. With particular emphasis on the fact that Manipulator™ has not yet received approval for use in the United States, OABA and Grain Farmers of Ontario have liaised with Ontario flour millers, wheat exporters, and Engage Agro (the Canadian distributor for Manipulator™) to discuss the implications of using this product on the 2016 Ontario wheat crop. It is essential that all industry supply chain participants (including growers, ag-retailers, country grain elevators, terminal grain elevators, feed mills, flour mills, etc.) are fully aware of the following facts. • Manipulator™ is a plant growth regulator for use in wheat. • Manipulator™ is approved for use in Canada and the European Union on cereals, but approval has NOT yet been obtained for use of the product in the United States. • Without product approval, the U.S. Environmental Protection Agency currently has a zero tolerance for any residues of the product (active ingredient). • Many Ontario country and terminal grain elevators have already established policies confirming that they will not be accepting wheat that has been treated with Manipulator™. OABA encourages all OABA ag-retail, grain elevator, and feed manufacturing members to communicate the seriousness of this situation with wheat growing customers. • Ontario flour millers (P&H Milling Group, ADM Milling, and Ardent Mills) have formally issued letters to suppliers that they will not accept wheat that has been treated with Manipulator™ (chlormequat chloride). • Grain Farmers of Ontario encourages Ontario farmers NOT to use Manipulator™ on the 2016 Ontario wheat crop due to the inherent market risk.